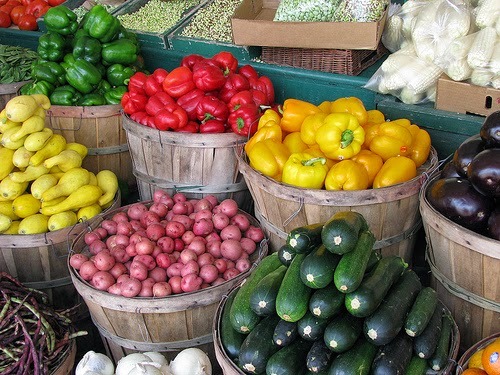 Feeding Our Lives, LLC: May is here and so are farmers' markets! May is here and so are farmers' markets! Do you like knowing where your food comes from? If so, you might enjoying perusing you local farmers' market! Ours just opened this past weekend, and it was wonderful: The weather was glorious, the farmers' stands were filled with smiling farmers, the community was bustling about greeting each other. The only bummer was that there wasn't much food because our weather has been so unpleasant all winter and spring.....BUT the market is open and it has me hopeful that there will be fresh veggies here soon! If you're not sure if your city has a farmers' market, check out Local Harvest or the USDA's web page. Tip: You'll find that different markets have different rules and foci. For example, the market close to me is a "producer only" and low pesticide to organic market. Another market near me is a "producer only" market, but it has no rules on how the food is grown. Find a market style that fits your wants and needs! 2nd Tip: Don't go to the market expecting to pay less for your food. These markets aren't intended to save you money. They are intended to: connect the farmer and the consumer, bring in super fresh food, connect the community, be an event for the community, and show people that food takes work. Remember, all the money you pay for these foods goes straight to the farmer. At the grocery store, you will pay the same price, get less quality food, and not support the farmer directly.